Black and White digital print users are excited about the new Multi-Channel 100% Pure Carbon print capability now available on the R800 and R1800. Inksupply.com has made available our 100% Carbon Eboni v1.1 ink for printing black only gallery quality prints on the R800/R1800. 100% pure carbon printing becomes a reality with the R800/R1800 printers by combining the 1.5 picoliter printhead technology available in the Epson R800/R1800 with the high Dmax and archivability of Inksupply.com Eboni Black v1.1 ink. The results	yield high resolution Black Only (BO) prints that will last more than a lifetime. No color pigments are used to make the print. The 3 Eboni black v1.1 inks in the positions specified make this possible. 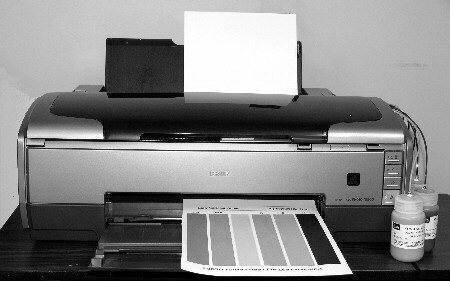 The new Multi-Channel 100% Carbon ink for the R800/R1800 printers is a unique solution that will allow the printer to retain all but two of the non black cartridge positions. By changing only the Photo Black and Gloss Optimizer cartridges the printer is still capable of producing high quality color images on matte papers using only the Epson driver in addition to the gallery quality carbon black only output. This inkset is meant for matte papers only. Convert your image to grayscale using your favorite method and save the image as a tiff file. Click here for detailed pdf instructions or here for detailed html formatted instructions by Paul Roark on the actual printing process as well as information regarding the inkset. Here are some additional options for converting your image to grayscale click on either Channel Mixer Method or Hue/Saturation Method. QuadToneRIP is available from http://www.quadtonerip.com for $50 US. If you are currently using MIS UC equivalent cartridges you will only need to purchase the 2 Eboni Only cartridges for the Gloss Optimizer and Photo Black Positions. The matte black position should already have our Eboni v1.1 ink installed, if not you will need a Eboni Black v1.1 cartridge for that position. If you are using the Epson OEM cartridges, you will only need to purchase the 3 Eboni Only cartridges (Gloss Optimizer w/EK, Photo Black with EK and Matte Black with EK Positions. The full color cartridge set is offered here for your convenience, and are exactly the same as our MIS cartridges for the R800/R1800 printers. If you are currently using R800/R1800 inks that are not OEM we recommend switching to Inksupply.com color inks to avoid ink compatibility issues. Additionally, we strongly recommend that you use cleaning cartridges to clear ink from the lines prior to the use of Eboni v1.1 and before switching back to the original Photo Black and Gloss Optimizer cartridges. Before switching to Eboni v1.1 in the Photo Black and Gloss Optimizer color positions, it is recommended that these positions be flushed with Inksupply.com Cleaning Cartridges. If you know how to refill your cartridges, or you are running a Bulk Feed System (Cartridge-Eliminator) then this is the bulk ink you will need to keep on printing beautiful Black Only Prints. We offer Cartridge-Eliminators (Bulk Feed) and Refill Kits for these printers so you can print Black Only economically.